This collective volume explores the ways merchants managed to connect different spaces all over the globe in the early modern period by organizing the movement of goods, capital, information and cultural objects between different commercial maritime systems in the Mediterranean and Atlantic basin. 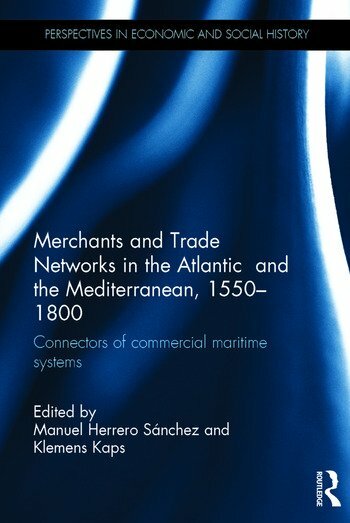 Merchants and Trade Networks in the Atlantic and the Mediterranean, 1550-1800 consists of four thematic blocs: theoretical considerations, the social composition of networks, connected spaces, networks between formal and informal exchange, as well as possible failures of ties. This edited volume features eleven contributions who deal with theoretical concepts such as social network analysis, globalization, social capital and trust. In addition, several chapters analyze the coexistence of mono-cultural and transnational networks, deal with network failure and shifting network geographies, and assess the impact of kinship for building up international networks between the Mediterranean and the Atlantic. This work evaluates the use of specific network types for building up connections across the Mediterranean and the Atlantic Basin stretching out to Central Europe, the Northern Sea and the Pacific. This book is of interest to those who study history of economics and maritime economics, as well as historians and scholars from other disciplines working on maritime shipping, port studies, migration, foreign mercantile communities, trade policies and mercantilism. Manuel Herrero Sánchez is Associate Professor of Early Modern History at Pablo de Olavide University in Seville, Spain. Klemens Kaps is a post-doc-Researcher at the Institute for Economic and Social History of Vienna University, Austria.